Each year I share my holiday card on Christmas as my Happy Holiday message. However, as I did last year, I will be taking a little holiday vacay from everything work and work-related, including blogging. So I am sharing my holiday card and sending my Happy Holiday message to you today. I have not taken a break from blogging since last year at this time. I love blogging, and I truly enjoy creating and curating content for &chloe, but as life in general has gotten busier, I also have to make a conscious effort to be more present and mindful during those opportunities to spend time with my little and extended family. All that said, thank YOU for reading. I appreciate it so much. I enjoy the process of putting all this out there, but I also love it when my readers enjoy reading it, too! So, this is my sign-off for 2013. I leave you with the sincerest wishes of a Happy Holidays to you and yours. My card really captures my feelings about this time of year - it really is one of the most wonderful times of the year. I hope that rings true for you and those you love, too. I will be back in 2014 (!!!) with new content like I discussed in my post after the survey and more. And, more details about my holiday card after the jump. 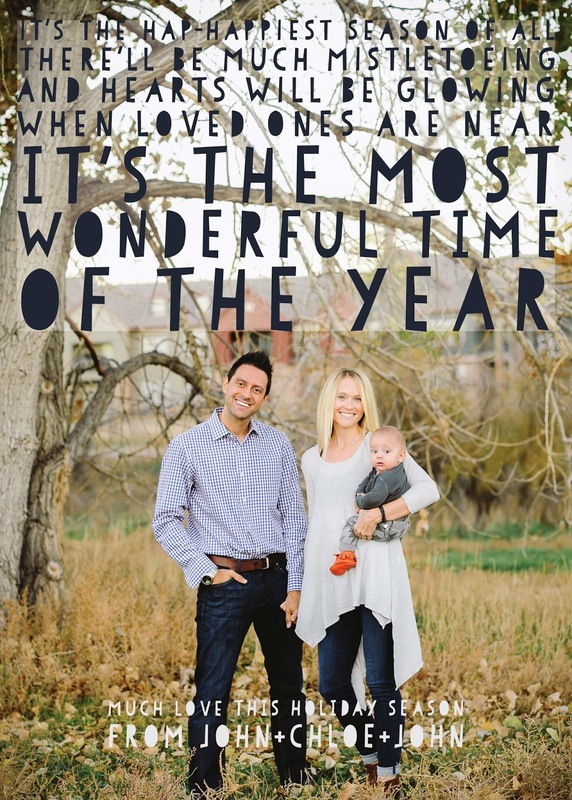 This year our card features a family photo taken by Kristin Mae Photography (I shared some of the other shots from that session here). A simple, modern typeface that is based on paper cut art. On the back I featured a more recent photo of little John (he was barely 6 months in the photo on the front, almost 7 months in the photo on the back, and by Christmas he is about 7.5 months old). I also included the link to all of the photos of John that I tag #johnraphaelmarty for easy viewing for family and friends. Lastly, I included a link to our blog, which may give you a hint where it is headed in 2014. I had envelopes printed with return addresses this time, instead of wrap around labels. The addresses for mailing were labels, however.